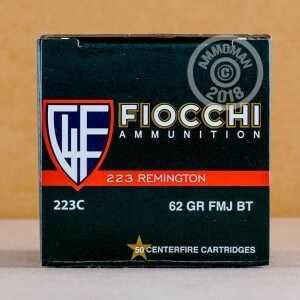 This Fiocchi 223 ammunition has similar ballistic properties to M855 ball ammo used by the US military, firing a heavy 62 grain full metal jacket bullet at a muzzle velocity of around 3,000 feet per second. Generally considered one of the better range loads available, this ammunition comes in a 1,000 round case at an affordable price for high volume shooting. Fiocchi is a long-established Italian ammo manufacturer that produces most of its ammunition for the US market in Ozark, Missouri. Their ammo uses non-corrosive Boxer primers and reloadable brass cases. 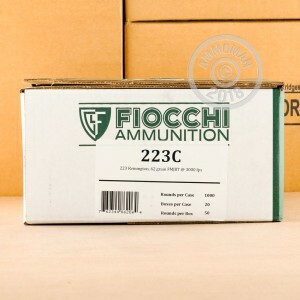 Unlike most manufacturers, Fiocchi offers .223 rounds in convenient boxes of 50 (with 20 boxes in each case). Grab this case or any other 1,000 round cases at AmmoMan.com to qualify for free shipping! Wanted to try some 62 grain in the AR and it shot fantastic. All 1000 rounds shot without issue. Will buy again. 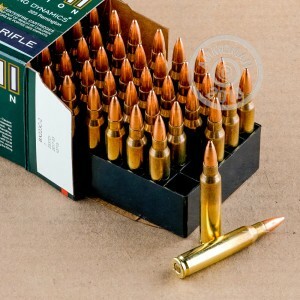 Great service, I have used this ammo in the past and expect no problems from this batch. Great Price, ordered on Thursday afternoon order was delivered Sat. I will definately be placing more orders..